July 2015 saw Dove Bingo swoop into the online scene as the 26th brand to open on the 15 Network powered by the Jumpman Gaming software. Often we find ourselves a little reluctant to rush along to a new brand on a network that has seen numerous brands launch back to back, we find things becoming a little repetitive. However, we were more than pleasantly surprised to find that this site had upped the ante a little with uniqueness but sadly, only as far as the structure of their welcome bonus. When you land at the site for the first time, if you’re a regular player on sites from the 15 Network, the first thing you notice is the lack on bonus spinning wheel! Dove Bingo have opted to offer their new player bonus in a completely different way, something we will look at later on in this review. The overall design of the home page is quite bland in comparison with other sites on the network, and in the online bingo market space but how much time do you spend their anyway? 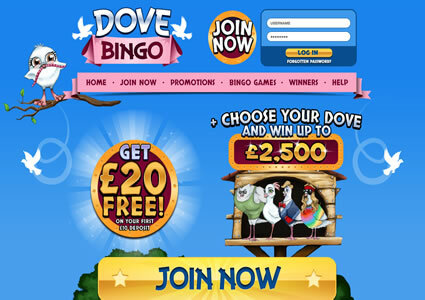 To get started with Dove Bingo you first have to create an account and this is done by simply providing a few details (financial information is not required at this point) and choosing a username for your new account. Within just a few moments you are ready to visit the bingo lobby and see exactly what the site has to offer by way of bingo, instant wins and jackpots. The main lobby is set out in the same way as all other sites on the network. 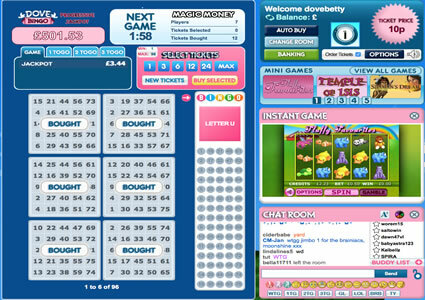 There are multiple tabs and each hosts a selection of bingo rooms, jackpot games or instant win offerings. For example, if you hit 90 ball you will see all the available rooms and a selection of information about each. The details are the room name, number of players, house prize, time until next game and price per ticket. This all helps you to make an informed decision about a room that suits your gaming needs and budget requirements. Once you have chosen a room and it opens, you’ll see that the software could do with a bit of an upgrade. It’s looking a bit tired and dated now but that said, it’s easy to purchase tickets, the game options and play are functional, it’s just a matter of aesthetics and personal preference. Dove Bingo has clearly tried to make themselves standout from the other 15 Network brands by changing up how the welcome bonus is given, and for that we applaud them. However, whilst the first impressions are good, sadly the promotional schedule and overall experience is too much like all the other brands available with no unique promotions or deal past the Dove bonus game. For new players making their first deposit of £10 or more at Dove Bingo there is the chance to earn up to a further £2,500 in bonus funds simply by playing their bonus game. When you have made that first deposit you get to choose one of the four doves. Once this has been done a game starts that shows your chosen dove pluck a worm from the ground to reveal your bonus. Check your emails because sometimes Dove Bingo send players an extra bonus that sees them eligible to play the game for a further bonus. Dove Bingo is quite limited in comparison with other brands online today in that it just offers two bingo game variants. 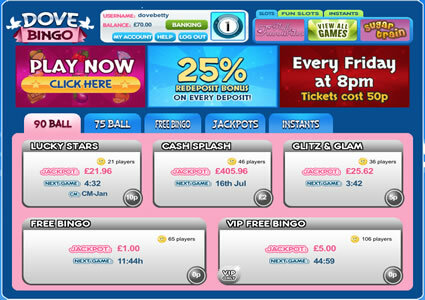 Players have the choice of either 75 ball pattern games or 90 ball bingo. 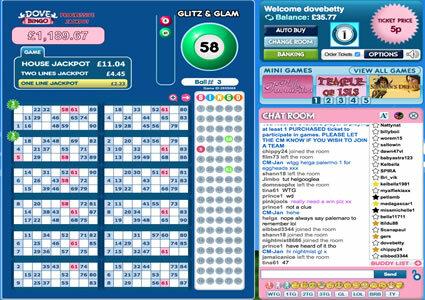 However, whilst the choice of bingo may not be as extensive as we would like, there are a great many instant win and slot games available to choose from. Jackpots aren’t quite what they might be at other sites but September 2015 saw a change to the schedule that saw ticket prices reduce and the jackpots given away increased. There are two progressive jackpots on offer at Dove Bingo. The 90 ball one can be won in 39 calls or less but for 75 ball, the jackpot can only be won on certain patterns and for each pattern, the number of calls required to win changes. Players are able to play team games each month for a chance to win a share of £300 in bonus funds. Teams are formed across the network rather than just with players from Dove Bingo.